Altar Ego Wedding Ed: Trust me, you want an unplugged wedding! Have you heard the term "unplugged wedding?" It's something trendy and cute, right? What does it mean and why do you need one? Here's the deal! 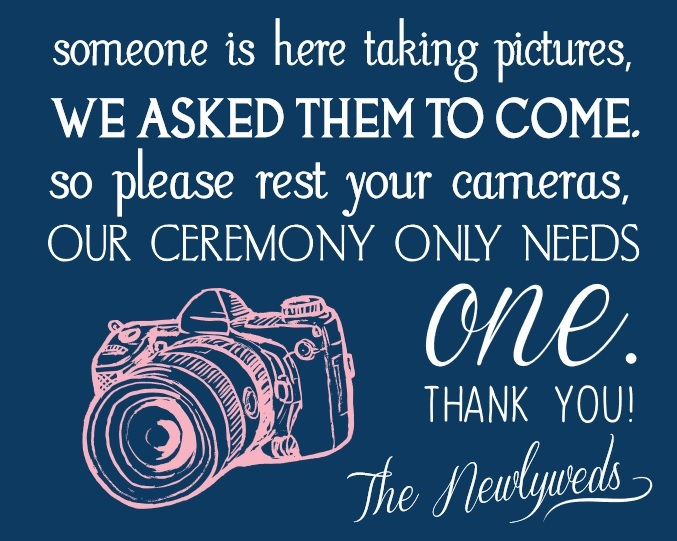 At an unplugged wedding, guests put down their cameras and cell phones and instead share in this experience with you! That's the sweet, sappy, albeit honest, package we present to your guests. Here's the practical explanation: you paid a lot of money for your professional photographer to capture your special moments beautifully, right? Is this how you want the moment when you're announced as "Husband and Wife" to look? And it looks beautiful! We had these cute signs created for our bride through Simply Personal. We sell their line of custom invitations and paperie products. Would you believe this works? It does! Couple the sign with this short announcement from your officiant at the beginning of the ceremony: "The couple invites you to be fully present in this moment with them by putting away your phones and cameras. Thank you!" Voila! You've got an unplugged wedding! Guests are typically respectful of your wishes and they genuinely enjoy the ceremony more! You're welcome!